Jaguar acquired Daimler in 1960 for what seems nowadays the ridiculously small amount of £3.4 millions. While they set about refining the SP250 with the B specification package, they obviously realised just what a superb engine they had inherited as part of the take over deal. They had a prototype Daimler Saloon running in November 1960 in a Mark I mule and the Daimler 2.5 litre V8 saloon was launched in 1962. It was based on the Jaguar Mk II, featured a fluted radiator grille and flying D bonnet motif plus Daimler badges. The front seats incorporated arm rests and options included PAS, radio, seat belts and wire wheels. With a 4.27 axle, top speed comfortably exceeded 110mph with economy of 20mpg typically being recorded. In September 1967, the Daimler V8-250 was introduced with what would be called nowadays "freshening actions" but what in fact was a thinly disguised cost reduction. The amount of interior wood was significantly reduced, much slimmer bumpers were used and a number of "goes-ins" and "goes-outs" were implemented. The result, in my opinion, was positive overall and managed to get another 2 years of production. As the Majestic Major, which incorporated a 4.5 litre version of Edward Turner's V8, ceased production in 1968, the V8-250 was the last use of a Daimler developed engine. Click through for further information about each upgrade. 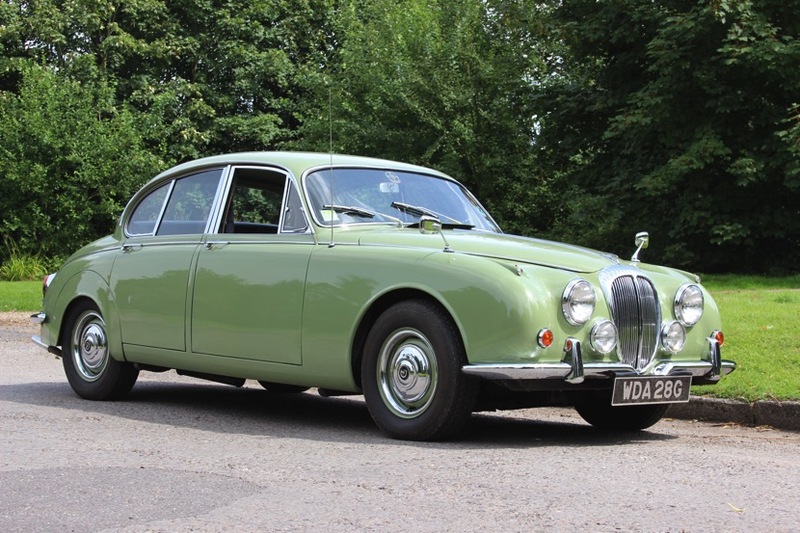 This 1969 Daimler Saloon was one of the last to be built. It is shown here in willow green and was fitted with a contrasting suede green interior.